Park anywhere near Debin Hall or the Children’s Building. 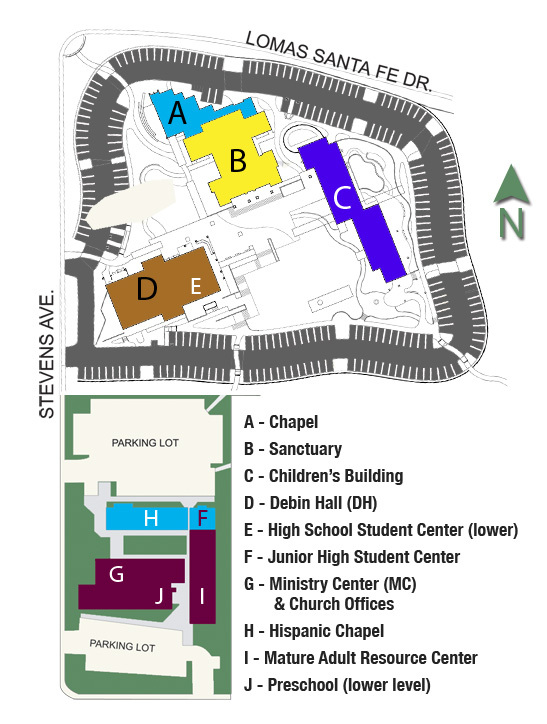 See Solana Beach Presbyterian Church campus map below. Head on over to Debin Hall, find your table, and enjoy the meeting! Help yourself to some delicious hot breakfast and yes, coffee! Meet some new ladies, check out the slides for announcements, and prepare for the meeting! Pick up your children promptly by 11:30am. This is a great help to our childcare workers. If you have to catch up with someone after the meeting, please do so after you have picked up your child(ren). DGL (Discussion Group Leader) = Each table will have a DGL that facilities group discussion, organizes table responsibilities and events, cares for moms, and communicates feedback to their Steering Committee. MENTOR MOM = Each table will have a Mentor Mom. They openly share their own experiences as mothers, offer support, and bring some much-needed perspective to discussion. They are all members of Solana Beach Presbyterian Church. MNO (MOMS’ NIGHT OUT) = Fun evening events that are held periodically throughout the year to give moms a break and time to hang out with each other! Bringing breakfast: Your table will partner with another table to provide food one time each semester. Details will be provided by your DGL. Serving in MOPPETS: Every mom in MOPS will spend 1 hour and 20 minutes in MOPPETS twice per year, once a semester. Details will be provided by your DGL. If you have any questions, please email sbpcmops@gmail.com and we will get back to you ASAP. See you Friday!